Dynamic software architectures emerge when addressing important features of contemporary systems, which often operate in dynamic environments subjected to change. Such systems are designed to be reconfigured over time while maintaining important properties, e.g., availability, correctness, etc. Verifying that reconfiguration operations make the system to meet the desired properties remains a major challenge. 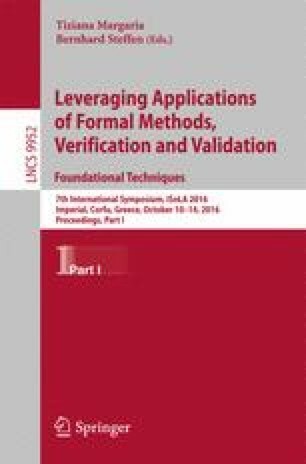 First, the verification process itself becomes often difficult when using exhaustive formal methods (such as model checking) due to the potentially infinite state space. Second, it is necessary to express the properties to be verified using some notation able to cope with the dynamic nature of these systems. Aiming at tackling these issues, we introduce DynBLTL, a new logic tailored to express both structural and behavioral properties in dynamic software architectures. Furthermore, we propose using statistical model checking (SMC) to support an efficient analysis of these properties by evaluating the probability of meeting them through a number of simulations. In this paper, we describe the main features of DynBLTL and how it was implemented as a plug-in for PLASMA, a statistical model checker. This work was partially supported by the Brazilian National Agency of Petroleum, Natural Gas and Biofuels through the PRH-22/ANP/ MCTI Program (for Everton Cavalcante) and by CNPq under grant 308725/2013-1 (for Thais Batista).